This guide offers brief descriptions of relevant natural resources collections. Links are provided whenever online inventories exist. Special Collections and University Archives collects in the topical area Environmental History, including collections that document the markings left on the land by human beings, with a particular emphasis on land use and how the use of the land is played out in the political process. In all the subcategories of this topic, collections focused primarily on Oregon and the Pacific Northwest will be considered. Records of Environmental/Conservation groups, activists, and leading conservation thinkers are sought. 1 box; .5 lin. ft. The company was formed in Elmira, NY, and incorporated in Colorado. Sale of stock in the company was to support an expedition to the Klondike to locate and mine gold. President of the company was John M. Dixon of Elmira. Andrew Sherwood, geologist of Mansfield, PA, was hired to lead a party of prospectors and miners. The group left in May 1898, and reached the Klondike via the Teslin trail. They wintered in Wrangell, and returned to the states in the spring. having located no mines, and extracted only a few samples of gold. Andrew Sherwood and his son, Hugh, later settled in Portland, OR. The records include Sherwood's reports to stockholders, company records, personal letters of Andrew and Hugh Sherwood, and mementos of the trip. 3 boxes; 4.5 lin. ft.
Andrews traveled to Oregon with his family in 1864. After attending Philomath College, Andrews worked at various jobs along the West Coast. He joined an expedition to climb Mt. St. Elias (Alaska) in 1896, and after that he worked at a series of posts at U.S. Customs Offices in Alaska. Between 1923 and 1929 he was an employee of the Interior Department Bureau of Education and Reindeer Service in Alaska. Andrews was especially concerned about the Eskimos and their reindeer herds, and the exploitation of the herds by corporations. He wrote several books about Eskimos and Alaska. The papers consist of business and personal correspondence; manuscripts; and files on W.T. Lopp (1908-1939) concerning education in Alaska. The accompanying photographs (1,600 prints, an album, and a book) have been cataloged separately. Reminiscences of a trip from Portland, OR, to Dawson, Yukon Territory, in 1898. Diary and account book of prospecting trip from Valdez to Lakina, Alaska, June 10 to July 25, 1902. With the diary is a letter from Harold Banta of Baker, OR, to Mrs. Mabel McClain, Mar. 19, 1939 giving provenance of diary and explaining certain entries. Beattie was in Alaska from 1905 to 1919 as a teacher and district superintendent of schools. He was associated with the Metlakahtla Colony from 1910, and was well acquainted with Edward Marsden. The papers contain letters collected by Beattie as source material for his book Marsden of Alaska (NY, 1955), and includes correspondence of Edward Marsden, Samuel Marsden, William Duncan, Sheldon Jackson, William T. Lopp, and Charles D. Jones. One folder contains mementos of the University of Oregon summer school in Alaska, 1929-1931. Diary of a trip to Alaska and the Klondike, 1898. Bullfinch left Weston, OR, on Mar. 2, 1898. The trip took him to Wrangell, Juneau, Skagway, Dyea, Dawson, Bonanza, Eagle City, Circle City, and Rampart City. He reached Port Townsend, WA, on Sept. 28. His portrait in Army uniform is with the diary. Cruise of the Althea from Portland to Alaska and return, 1912; recollections of W.H. Hembree, builder and master. Includes an interview with Hembree by Mabel McClain, Mar. 1, 1947, and Hembree's notes on the Blue Bucket mine. 2 boxes; 1 lin. ft.
Kehoe was an attorney from Oregon; he moved to Alaska in 1919, and practiced law in Juneau. He was United States commissioner at Ketchikan, 1924-1929, a member of the Territorial Legislature in 1933 and 1943, and Secretary of Alaska, 1951-1952, among others. The papers contain personal diaries, case notes, and correspondence. Langille was born in Nova Scotia. In 1882 he came to Hood River, OR, where the Langille family was associated with the construction, in 1889, and operation, from 1891-1906, of Cloud Cap Inn on Mt. Hood. Langille and his brother, Harold D., were early climbers and guides on the mountain. In 1897 Langille went prospecting in the Klondike. In 1903 he was appointed forester if Alaska. He went to Sao Paolo, Brazil, in 1912 for the Paulista Lumber Company. After World War I he worked for the forest service and the Oregon State Parks Department. 6 boxes; 3 lin. ft.
Lopp was known to the native whalers and fishermen of Alaska as the "Reindeer Man." He started out as a missionary teacher at Cape Prince of Wales, on the Bering Strait, in1890. Two years later he was made superintendent of the reindeer station at Teller. He had reindeer brought over from Siberia, and taught the Eskimos how to be herdsmen. Lopp also established numerous schools and hospitals before his position was eliminated in 1925. The papers include journals; correspondence; manuscripts; subject files; printed material; and photographs. The manuscripts include materials for Lopp's book The Great Reindeer Drive. 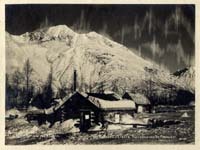 Several dozen images of Alaska during the Gold Rush period, including Chilkoot Pass and Sheep Camp among other locations, are included in the general Print Collection. Photographers include Eric A. Hegg and J.E. Worden. The company was owned by Theodore and William Nicolai. Anthony Neppach was secretary. Most of the letters are to company representatives in Alaska. Several of the letters were written from or en route to Skagway, Alaska, 1897-1898. Photograph album from Rampart City, Alaska, 1898, kept by A.J. Balliet. Letter from Fred D. Van Wagonen, Seattle, WA, to Ann Van Wagonen, Fulton, NY, describing an Alaska mining trip. Also mentions Father Barnum, a Jesuit missionary. Transcripts of official reports, with accompanying documents, of the Western Union Telegraph Company Exploring Expedition in the Alaska-Yukon region, 1865-1867. Most of the reports and letters are to or from Col. Charles S. Bulkley, director of the expedition. Letters to Mrs. Fred J. Wood of Seattle, 1900-1901. Wood was the assistant treasurer of the Seattle-Yukon Transportation Company. The letters are written from Alaska and Yukon Territory, particularly Dawson, and describe commercial affairs and social life.